Map of the new Northern Forest once it’s ready, which will cover Northern England coast to coast. Credit: Woodland Trust. With just 13 percent of its surface area covered in woodlands, the UK is the least leafy country in the European Union. The situation is even more dire in England, where tree cover is less than 8%. Now, the government plans to reverse centuries of industrial and agricultural exploitation. 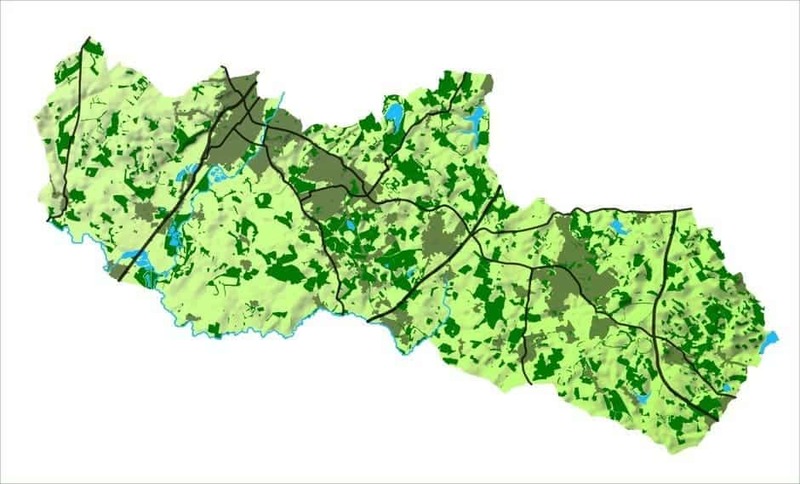 To cover ground fast, the UK has an ambitious plan that will see a huge new forest span the country from coast to coast. The new so-called Northern Forest will stretch over a 62,000-acre patchwork along a 120-mile strip, ultimately becoming home to 50 million trees and countless wildlife. This green belt that will stretch from Hull to Liverpool will reportedly cost British taxpayers £500m (USD690m) over 25 years, of which £5.7m (USD7.8m) have already been awarded. The UK has very good reasons to embark on a reforestation project of this unprecedented scale. Much of the country’s historic forests have been lost to grazing grounds and industry, and those that remain are constantly under stress by threats such as infrastructure projects. For instance, the Woodland Trust identified 98 ancient woods currently being threatened with loss or damage by the controversial HS2 rail link. Besides freshening and cooling the air or providing shelter to wild animals, forests also reduce the pollution and noise caused by highways. Woodlands are also fantastic natural flood and soil loss prevention systems. Much of the Northern Forest cover will be concentrated around major cities, much to the delight of locals who either don’t currently have options to relax in nearby nature or flock to overcrowded parks. This impressive transformation is already underway. In a sense, the gears of British reforestation had been set in motion 28 years ago when the first saplings of the National Forest were planted. As of 2016, 8.5 million trees have been planted, representing 20 percent of the designated area. The plan is to ultimately cover a third of this area with woods arranged in a jigsaw puzzle layout. The area of the National Forest in 1991, before planting began. Credit: National Forest. The same area in 2016, now far more covered in trees. Credit: National Forest. Not everyone is excited about the announcement, however. A Friends of Earth spokesman, for instance, criticized the British government for making plans to plant a huge forest while, at the same time, agreeing to the destruction of ancient woodlands. “It is a supreme irony that tree planters will have to get funding from HS2, which threatens 35 ancient woodlands north of Birmingham,” Paul de Zylva from Friends of Earth told BBC News. “You simply can’t compare the biodiversity value of new sticks in the ground with ancient forest,” he added. Writing for The Guardian, journalist Patrick Barkham called the Northern Forest greenwashing, arguing that generic planting “diverts funds and attention away from real conservation, and encourages people to go on destroying wild trees”. Also, while the Northern Forest looks like a great project on paper, the fact that last year saw the lowest level of planting in England doesn’t bode too well. Only 1,000 hectares of new trees were planted last year in England, which might make many citizens rather skeptical that the government will actually deliver on its promises. At the end of the day, however, I don’t think anyone really has something against having more trees. Let’s just hope Britons can both admire new forests and keep their old ones at the same time.